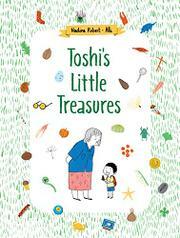 On a series of walks with his grandmother, Toshi collects small treasures. This interactive book celebrates a favorite childhood activity. Toshi’s understanding grandmother gives him a red backpack to store his finds, and off they go: to a nearby riverbank, into town, the forest, the countryside, the park, and the beach. After each double-page spread that shows them exploring each destination and labels some of Toshi’s finds in context, there’s a page of Toshi’s treasures, identified, and a puzzle page of numbered and connected images. Answers, and a bit of further information, are in the back of the book. Toshi’s discoveries may be man-made (a bottle cap, a coin) or natural (an empty snail shell, a feather). Aki’s illustrations have the appearance of swift ink-and-watercolor sketches. With a few surprising exceptions (a crab’s carapace is identified as a horseshoe crab’s, and one picture of a gannet misplaces its yellow markings, among others), they’re recognizable and reasonably accurate. Plastic dinosaurs and soda-can tabs can be found anywhere in this country, but the flora and fauna are more limited to the northeastern states and eastern Canada. (This title was originally published in French, in Quebec.) At the end, Toshi’s grandmother (sadly, the illustrator emphasizes her wrinkles rather than her warmth) identifies some of the animals they saw on their trips. Readers can go back and find them in the various spreads.